Published in the South Kent Gazette, 24 September, 1980. The lower part of the street, including the opening to the Market Place, might also have been accomplished by agreement, but the parties interested could not agree. 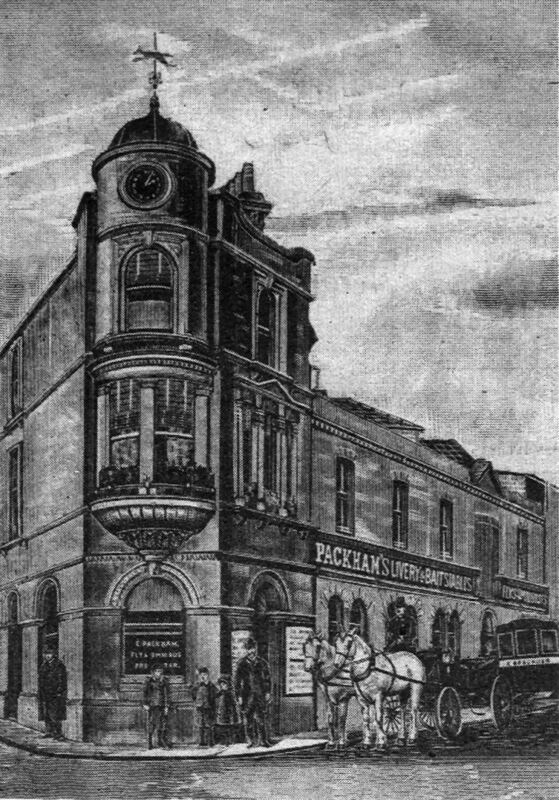 When the new street was first proposed, the land at the bottom, where stood the stables and yards of the Antwerp Hotel, were the property of Mr Walker, the owner of the adjoining brewery, but he sold both the stables and the Antwerp Hotel, which stood at the entrance to Biggin Street, for £2,900, to a Mr Huntley, and when the Paving Commissioners tried to purchase the stables from the new owner it was discovered that, in opposition to the usual rules governing values, a part was deemed to be worth more than was paid for the whole. The Paving Commissioners offered Mr Huntley £1,500 for the stables, which blocked the bottom of Castle Street, but that was rejected, and he refused to name a price, hence there was no option but to apply to Parliament for powers for compulsory sale. Eventually, the Bill became law, and in November 1836, a jury of 24 burgesses of Dover was empanelled at the town hall to assess the compensation that should be paid to Mr W. S. Huntley for a 40ft. road through his stables. It was estimated that the amount of land required was 4094 superficial feet, which the Paving Commissioners’ Surveyor valued at 7/6 per foot. The old buildings thereon were valued at £40, the rebuilding of the remainder £630, and the loss during alterations £60, which would have made a total of £2,275. After the case had been duly argued, the award of the jury was a lump sum of £3,026 11s. 6d., made up as follows: £1,446 11s. 6d. being at the rate of 6/6 per foot; £40 for old materials; £630 allowed for rebuilding; £60 for time lost; and £850 compensation for loss of business. This was an expensive finish to the making of a valuable street, which had otherwise cost the town very little, and which had added very largely to the rateable value of the borough, as well as being a public convenience. The street was formally opened into the Market Square on the 17th March 1837. The lower port was unsatisfactory as an improvement apart from the cost, for, as only the bare width of the road was bought, the owner was left to rebuild according to his own idea and convenience, with the result that for many years one side was not properly rebuilt. It was not until the turn of the century or thereabouts that it was rebuilt in a way worthy of an approach to the Market Place. The other public cost of laying out Castle Street was £1,818 for various works above the opening, and £350 paid to Mr George Flashman for taking 8ft. 6in. off his corner, making the total public cost of Castle Street £4,149, added to which the promoters paid Mr Humphreys £2,000 for his land and £7,000 for Mr Jeken’s property, apart from the Almshouse land, the remaining portions of which was much improved in value. Castle Street has the advantage of uniformity of width, and although the houses are not all alike, there is harmony of design, except the blot at the lower end, where obstruction has left its mark. Russell Street is a part of the scheme, and being a nice wide thoroughfare, it would have been a still greater acquisition if it had been carried through to the sea, as originally intended. The opening of Castle Street made a new direct way to, the “Back of Charlton,“ which was later developed as the Maison Dieu (Road. When the building operations commenced at the top of Castle Street, in 1838, there was a narrow road caller Maison Dieu Place, where East-brook Place now is; and the Castle Street promoters gave up land to make that road 30ft. wide, which has enabled the thoroughfare to link in as a part of Maison Dieu Road without the further cost of widening. For the best part of the 19th century the Antwerp Stables (above, left) standing on the Church Street corner of Castle Street facing the Market Square, provided an important service in Dover. Established by a Mr Stokes at about the time that the opening was made on that side of the market place into Castle Street, they were a natural successor to the old stables of the Antwerp Hotel over which there was a. court action referred to below. The business was subsequently taken over by Mr E. Packham, who was a posting master by appointment to Prince Arthur. He in turn was succeeded as fly and horse-bus operator in the mid 1890s by Mr T. W. C. Laslett. 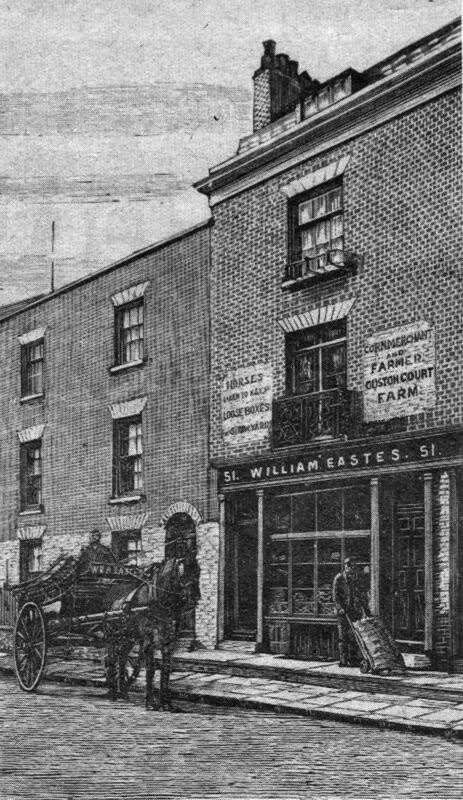 Another important business in Castle Street in the 1890s and well into the 20th century, was that of William Eastes, fanner, corn merchant and dairyman (above). 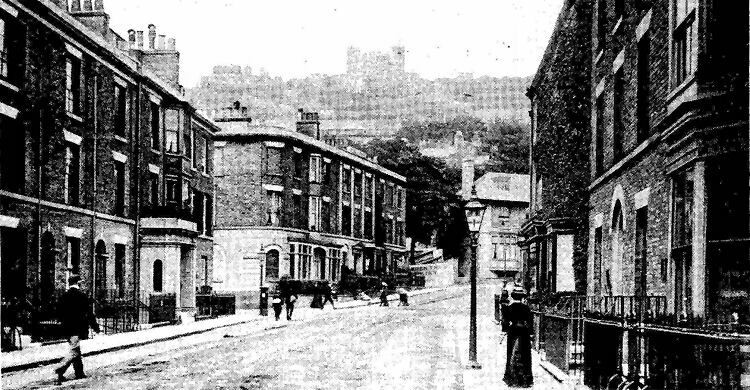 Another dairy business nearby was that of H. A. Dudman, in Ashen Tree Lane, whose sign is visible in the centre of the 1890s picture of Castle Street above.